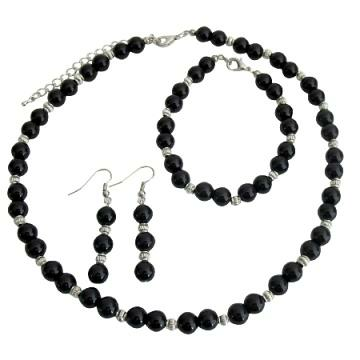 This discounted, classy, dramatic & sophisticated necklace earrings & bracelet has gorgeous black pearls accented with bali silver spacer. Buy Alluring Black Pearls & Silver Spacer Wedding Jewelry Set , sold & shipped by Fashion Jewelry For Everyone where you can shop online for Leading Online Retailer for Indian Fashion Jewelry. This Necklace Sets collection has been tagged as holiday gift, 3 pearl earrings, fashion necklace, cheap costume jewelry.